This week, we're celebrating World Space Week (#WSW16). Today we're focussing on our International Partnership Programme. The aim of the programme is to open opportunities for the UK space sector to share expertise in real-world satellite technology and services overseas and develop international partnerships for mutual benefit. Every year many mariners are lost at sea, with a disproportionate number being those in small vessels, such as artisanal fishermen. Countries such as South Africa, which have long coastlines, a high proportion of small craft and particularly bad weather, face distinct challenges in locating and rescuing people because many boats do not carry any form of location reporting device. With funding from the UK Space Agency’s International Partnership Space Programme (IPSP), exactEarth Europe carried out extensive sea trials of a modified, battery-operated Automatic Identification System (AIS) transponder, which provides a cost-effective way of providing regular updates via satellite on the position of small vessels. The trial validated operational aspects of the system and demonstrated the benefits of such a service to South Africa’s national maritime safety organisation. The South African Maritime Safety Authority (SAMSA) is responsible for all maritime safety in South African waters and for search and rescue operations across a vast area that includes some very cold and treacherous seas. South Africa’s exclusive economic zone covers 1.5 million km2 and its search and rescue area extends to over 27.7 million km2. 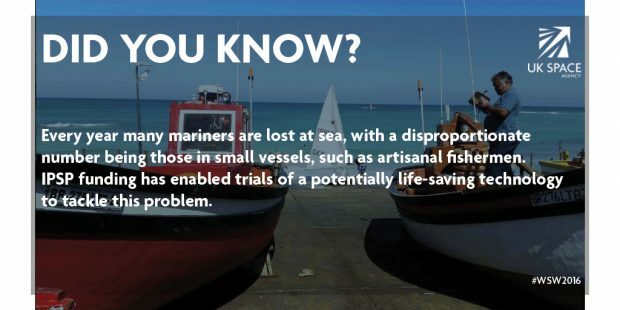 In this context, SAMSA is particularly concerned about small vessels, including artisanal fishing boats. Many of these should not travel far from shore, but may do so because they are dependent upon catching fish or because they get into trouble due to mechanical failure or bad weather. However, when a small vessel is reported missing, there is often no way to identify where to search for it, because such craft are not required to carry any form of automated tracking system (such as an AIS transponder). SAMSA’s requirements pointed to the use of AIS transponders in some form. Globally, two ‘classes’ of AIS transponder are used by different sizes of ships. The smaller Class B devices have historically been used on a voluntary basis, but their lower power means that detection by satellites (as opposed to coastal receivers, which can pick up their signals when ships are close to shore) can be unreliable. exactEarth Europe and its IPSP partner SRT Marine Technology have developed a firmware upgrade to one of SRT’s existing AIS transceivers which enhances its ability to be detected by exactEarth’s satellite constellation. This new transponder – the Advanced Class B Satellite Enabled AIS (ABSEA) Identifier – nominally uploads details of its position every two minutes. However, because AIS position reports are not always detected by satellite, it also uploads position reports for the previous 2.5 hours, allowing a vessel’s path to be traced even if some interim position reports are missing. The ABSEA Identifier is battery-powered and can easily be fitted via a small bracket, even onto very small boats. The battery lasts for 2 to 3 days when transmitting a combination of satellite and terrestrial messages, although an Identifier can be connected to a vessel’s on-board power supply (12V or 24V) if one is available. Within the OASIS project, and with the local support of MDSol, ABSEA transponders were successfully installed and tested on 50 small fishing boats in various locations in South Africa from December 2015 to April 2016. Via MDSol, exactEarth Europe also provided SAMSA with an ABSEA data feed for integration into SAMSA’s own systems and a monitoring tool (ShipView) which can display any vessel’s latest position as well as historical data in the form of tracks on screen. hard for an SME such as exactEarth Europe to fund. exactEarth Europe now knows that the technology can work on a large scale and was able to gather valuable feedback from users through its relationship with SAMSA, which liaised with the individual fishermen and boat owners. Establishing this relationship with SAMSA (and, later, for the project extension in Namibia) was made easier for lead partner exactEarth because the IPSP project was sponsored by a UK governmental organisation in the form of the UK Space Agency, which gave the project added gravitas.